LOCAL golfers will be tuning up and teeing off against a mix of celebrities and well-known local musicians following the launch of a unique charity golf event, created to raise money for the budding sports stars of tomorrow. 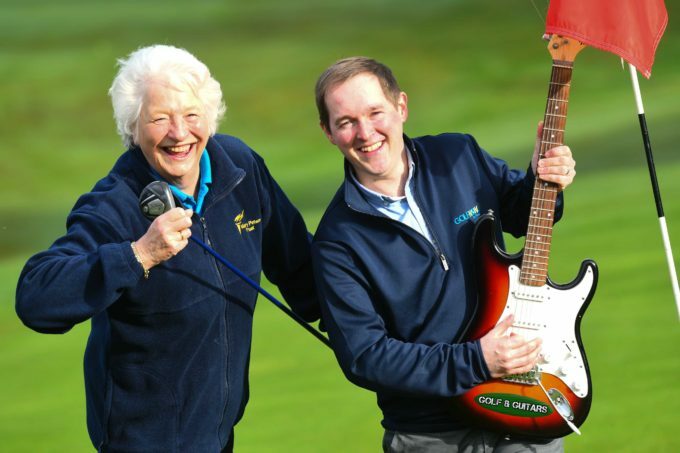 ‘Golf and Guitars’ promises to inject a little ‘rock and hole’ into the peaceful tranquillity that is normally associated with the game of golf, and already stars like Brian McFadden and Keith Duffy from Boyzlife have confirmed their participation at the event. With proceeds going towards the Mary Peters Trust, ‘Golf and Guitars’, in association with online golf booking site GolfNow, will take place at Holywood Golf Club, where local superstar Rory McIlroy learned his trade, on Friday May 19, 2017. A number of other well-known local businesses including leading motor company Charles Hurst Group, taxi firm Fonacab and public relations specialists Duffy Rafferty Communications have also lent their support to the event. Golf will be played during the day, followed by a live music gig in the evening, featuring ‘The Band of Hackers’… a one-off collaboration that will include local session musicians and possibly a few famous guests. A team of four costs just £140 for the ‘Golf and Grub’ package, with the full ‘Golf, Grub and Guitars’ package (which includes the evening gig) costing £180 per fourball. For anyone wanting to play a ‘solo’ round, individual places are also up for grabs at a cost of £35 (or £45 including gig) – while music fans who don’t play golf can attend the live gig only for just £15 per ticket. Anyone interested in taking part need not fret as there are still spaces available – but golfers are advised to register their interest by contacting event coordinator Paul Kelly on prckelly@googlemail.com as soon as possible to avoid disappointment. Gillian Hetherington of the Mary Peters Trust said: “Golf and Guitars is a great event for a great cause, bringing the worlds of music and golf together to support thousands of talented young sportsmen and women, both able bodied and disabled, from across Northern Ireland and to help them realise their sporting dreams, through the Mary Peters Trust. “Whilst a lot of people would never link the worlds of golf and rock music, there are actually quite a few musicians who are quite handy on the golf course, from rockers like Alice Cooper, Neil Young and Pink Floyd’s Roger Waters to the likes of Justin Timberlake, Niall Horan and even rapper Snoop Dogg! “We’re delighted that closer to home, stars like Brian McFadden and Keith Duffy have already signed up to play golf at the event and we’re hoping to add a few more big names to the line-up between now and May,” concluded Gillian. Since it was founded in 1975, the Mary Peters Trust has helped over 5000 sports people in Northern Ireland, including Carl Frampton, Graeme McDowell, David Humphreys, Paddy Barnes, Michael Conlan, Kelly Gallagher, Michael McKillop, Janet Gray and Katie Kirk. Andrew Hollywood, Marketing Director, International for GolfNow, said: “We are proud to sponsor the first annual Golf and Guitars event in support of the Mary Peters Trust. The areas of sport and music are great unifiers and, time and time again, we have seen how our home grown stars, from Carl Frampton and Rory McIlroy to Van Morrison and Snow Patrol, have brought everyone together and made us all proud to be from Northern Ireland. “The Mary Peters Trust plays an invaluable role in supporting our sports stars of tomorrow, both disabled and able-bodied so we are delighted to support this event and hopefully help the Trust continue their good work in the future,” added Andrew. To find out more about Golf and Guitars, book a tee-off time or purchase tickets for the live music gig, click on golfandguitars.co.uk or send an email to Paul Kelly at prckelly@googlemail.com. MEDIA ENQUIRIES: For further information, please contact Michael Rafferty or Ciara Kinkead of Duffy Rafferty Communications on 028 9073 0880.